The Native American story of Black Hawk. Learn about the culture, stories, myths and legends of American Indians and their famous chiefs and tribes. A Native American Story of Black Hawk to teach kids about Native Indians in a short, enjoyable, easy to read format. The two small nations of the Sacs and the Foxes had lived as one family for a long time. They were of the Algonquian tongue. From the northern Great Lakes country they had moved over to the Mississippi River, and down to Illinois and Iowa. Their number was not more than six thousand. They were a shave-head Indian, of forest and stream, and accustomed to travel afoot or in canoes. The Foxes built their bark-house villages on the west side of the Mississippi, in Iowa's "great nose." They called themselves Mus-qua-kees, or the Red Earth People. They said that they had been made from red clay. Their totem was a fox; and the French of the Great Lakes had dubbed them Foxes—had asserted that, like the fox, they were quarrelsome, tricky and thievish. As warriors they were much feared. They had lost heavily. The Sacs built opposite, on the Illinois shore, from Rock River down. They called themselves Saukees, from their word O-sa-ki-wug, or Yellow Earth People. They were larger and better looking than the Foxes, and not so tricky; but their bravery was never doubted. These two nations together drove out the other Indians in this new country. 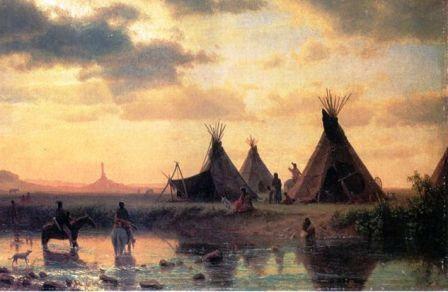 They whipped even the Sioux, who claimed the northern Iowa hunting grounds; they whipped the Omahas, Osages and Pawnees of the west, the Mascoutins to the south, and the Illinois tribes. They were here to stay. While the men hunted and fished and went to war, the women raised great crops of beans, squashes, melons, potatoes and Indian corn, and gathered the wild rice of the lakes. Among the Sac leaders was Ma-ka-tai-me-she-kiakiak—Big-black-breast, or Black Hawk. Like Little Turtle of the Miamis he had not been born a chief; but he was of the Thunder clan, the head clan of the Sacs. His father was Py-e-sa, a warrior of the rank of braves, and keeper of the tribal medicine-bag. His grandfather was Na-na-ma-kee, or Thunder—also a brave. Black Hawk was born in 1767, in Sauk-e-nuk, the principal Sac village, where Rock Island, Illinois, now stands, north of the mouth of the Rock River. He won the rank of brave when he was only fifteen years old. He did this by killing and scalping an Osage warrior, on the war-trail against these head-takers. After that he was allowed in the scalp-dances. He went against the Osages a second time. With seven men he attacked one hundred, and escaped carrying another scalp. When he was eighteen, he and five comrades pierced the Osage country across the Missouri River, and got more scalps. When he was nineteen, he led two hundred other braves against the Osages, and killed five Osages with his own hand. By his deeds he had become a chief. In a battle with the Cherokees, below St. Louis, his father Pyesa fell. Young Black Hawk was awarded the medicine-bag—"the soul of the Sac nation." In the early spring of 1804 a man of the Sac band then living on the Missouri, near St. Louis, to hunt and trade, killed a white man. He was arrested. The Sacs and Foxes held a council and chose four chiefs to go to St. Louis and buy their warrior's freedom with presents. This was the Indian way. The chiefs selected were Pa-she-pa-ho, or Stabber, who was head chief of the Sacs; Quash-qua-me, or Jumping Fish; Ou-che-qua-ha, or Sun Fish; and Hashe-quar-hi-qua, or Bear. They went in the summer of 1804 and were gone a long time. When they returned, they were wearing new medals, and seemed ashamed. They camped outside of Saukenuk for several days, before they reported in council. The man they had been sent to get was not with them. Finally, in the council they said that they had signed away a great tract of land, mostly on the west side of the Mississippi above St. Louis, in order to buy the warrior's life; they had been drunk when they signed—but that was all right. However, when they had signed, the warrior was let out, and as he started to come to them, the soldiers had shot him dead. They still were not certain just what land they had signed away. That made the council and people angry. Black Hawk called the chiefs fools. They had no right to sell the land without the consent of the council. After this, the "Missouri band" of the Sacs kept by themselves, in disgrace. It was too late to do anything more about the treaty. The United States had it. An Indian gets only one chance—and Head Chief Pashepaho himself had put his mark on the paper. The United States has two chances: the first, on the ground; the second, when the paper is sent to Washington. Later it was found that Pashepaho and the others had signed away all the Sac and Fox lands east of the Mississippi River! That was how the treaty might be made to read. The payment for many millions of acres was $2,234.54 down, in goods, and $1,000 a year, in other goods. But there was one pleasing clause. As long as the United States held the land, the Sacs and Foxes might live and hunt there. Any white men who tried to come in were to be arrested and put off. At any rate, although Black Hawk raged and said that the treaty was a false treaty, it stood. The United States officials who had signed it were men of honest names, and considered that they had acted fairly. But Black Hawk never admitted that. The United States was to erect a trading post, up the Mississippi, for the convenience of the Sacs and Foxes. In 1808 soldiers appeared above the mouth of the Des Moines River, on the west side of the Mississippi, in southeastern Iowa, and began to build. This turned out to be not a trading post but a fort, named Fort Belle Vue, and afterward, Fort Madison. The Sacs and Foxes, and their allies, the Potawatomis and Winnebagos, planned to destroy it, and made attacks. Black Hawk was sore at the Americans. He listened to the words of Tecumseh and the Prophet, accepted the presents of the British agents who came to see him, and with two hundred warriors marched to help the British in the War of 1812. The British traders had been more generous with the Indians than the American traders. Now the British father at the Lakes saluted him as "General Black Hawk." Only Black Hawk's band went. All the other Sacs and Foxes paid attention to the talk of Keokuk, the Watchful Fox, who was the Sac peace chief. Like the great Cornstalk, he said to the people that if they were bound to go to war, they should first put all the women and children "into the long sleep, for we enter upon a trail that has no turn." He was called a coward by the Black Hawk band; but the other Sacs and Foxes stayed where they were. "General" Black Hawk fought beside General Tecumseh. He asserted that he was in the big battle when Tecumseh was killed. When be found that the Indians had nothing to gain in the war, he came home. He had done wrong to go at all. Then he learned that a young man whom he had adopted as a son had been murdered, while hunting, by bad whites. They had seized him, tied him, killed him and scalped him. The young man had not been to war, and Black Hawk could see no reason for the killing. So he set forth in revenge, and fought a battle with the United States Rangers. He remained unfriendly. It all dated back to the year 1804, and the treaty signed by Pashepaho, by which the Sacs had lost their country. They loved this country. They especially loved Rock Island, in the Mississippi—where today is located a Government arsenal. It was indeed a beautiful island for them. It bore grapes and nuts, and they called it their garden. In a cave there, a kind spirit dwelt, who blessed the land of the Indians. The spirit had white wings, like a swan. But in 1816 the United States built Fort Armstrong right on top of the cave, and the good spirit flew away, never to come back. The guns of the fort frightened it. Black Hawk himself had another favorite spot, upon a bluff overlooking the Mississippi River and his village of Saukenuk. Here he liked to sit. It is still known as Black Hawk's Watch Tower. After Fort Armstrong was built, and the United States was again at peace with the other white nations, settlers commenced to edge into this Sac country of western Illinois. Although by another treaty, which Black Hawk himself had signed, the treaty of 1804 was repledged by the Sacs and Foxes, this all was United States land, and no settlers had any rights to it. The Indians were unable to put the settlers off, and trouble arose. Once Black Hawk was taken, in the forest, by settlers who accused him of shooting their hogs; they tore his gun from him, and beat him with sticks. This was such a disgrace to him, that he painted a black mark on his face, and wore the mark for almost ten years. Only a scalp could wipe it off. The white trespassers kept coming in. They respected nothing. They even built fences around the corn fields of the principal Sac village, at the mouth of Rock River; they ploughed up the grave-yard there; they took possession of Black Hawk's own lodge; and when in the spring of 1828 the Black Hawk people came back from their winter hunt, they found that forty of their lodges had been burned. Up to this time none of the land had been put on the market by the United States. But the Indian agent was trying to persuade the Sacs to move across the Mississippi, into Iowa. That was for their own good. The white settlers were using whiskey and every other means, to get the upper hand. Chief Keokuk agreed with the agent. He was not of the rank of Black Hawk and the Thunder clan, but he had fought the Sioux, and was of great courage and keen mind and silver tongue. He was an orator; Black Hawk was a warrior. So the Sacs split. Keokuk—a stout, heavy-faced man—took his Sacs across into the country of the Foxes. Black Hawk's band said they would be shamed if they gave up their village and the graves of their fathers. Black Hawk visited some white "chiefs" (judges) who were on Rock Island. He made complaint. He said that he wore a black mark on his face; but that if he tried to avenge the black mark, by striking a white man, then the white men would call it war. He said that the Sacs dared not resent having their lodges burned and their corn fields fenced and their women beaten, and the graves of their fathers ploughed up. "Why do you not tell the President?" "He is too far off. He cannot hear my voice." "Why do you not write a. letter to him?" "It would be written by white men, who would say that we told lies. Our Great Father would rather believe a white man, than an Indian." The two judges said that they were sorry for the Sacs, but could do nothing. Now in 1829 the settlers were so anxious to keep the Sac lands at the mouth of the Rock River, that the Government put these on the market. This would dispose of Black Hawk's people, for they would have no village. Whether the other lands were sold, did not matter. It was done while Black Hawk and his men and women were hunting. On their return to plant their crops, they learned that their village and grave-yard had been sold to the whites—the most of whom were already there. So the white people had won out. They in turn asked protection of the Government, from "General Black Hawk" and his band. The Government listened, and ten companies of regular troops were sent to Rock Island in a steamboat, to remove the Sacs, "dead or alive," to the west side of the Mississippi. A council was held with Black Hawk at Fort Armstrong, on Rock Island. Black Hawk rose to speak. He said that the Sacs never had sold their lands; it had been a mistake, and that they were bound to keep their village. "Who is this Black Hawk?" retorted General Edmund P. Gaines, the commander of the troops. "Is he a chief? By what right does he appear in council?" Black Hawk wrapped his blanket around him and strode angrily out of the council room. But the next morning he made answer. "My father, you asked yesterday, who is Black Hawk? Why does he sit among the chiefs? I will tell you who I am. I am a Sac, my father was a Sac—I am a warrior and so was my father. Ask these young men, who have followed me to battle, and they will tell you who Black Hawk is. Provoke our people to war, and you will learn who Black Hawk is." More troops were called, until there were twenty-five hundred. But seeing so many soldiers marching. Black Hawk took all his people and camped across the Mississippi, under a white flag. After this Black Hawk was required to sign another treaty, which made him say that he had tried to enlist the Potawatomis, Winnebagos and Kickapoos in a war against the United States. It did not mention the fact that for a dozen and more years the whites had been warring upon him by seizing his lands and ploughing his fields and burning his lodges. The paper also set him down below the other chiefs, who had left their lands. It set him below Keokuk, and the Fox chiefs—and this hurt him deeply. All the Sacs and Foxes laughed at the idea of Keokuk, and his lowly clan, being placed above Black Hawk and the Thunder clan. In these years of trouble, the Black Hawk band had killed or abused no white settlers. The so-called "war," on their part, had been a war of words and fences. Now they soon were to take up the hatchet. They had been expelled over the river in this year 1831 too late for planting crops. The white settlers declined to share with them, from the fields at the village of Saukenuk. One night some of the Sacs crossed "to steal roasting-ears from their own fields," as they said. They were shot at by the settlers, and driven off. This made more bad feeling. Black Hawk had sent his head warrior, Nah-po-pe, or Soup, up to Canada, to ask council from the British "father" there. He had been "General Black Hawk" in the British army, and thought that he deserved help. But the United States and Great Britain had been at peace many years. The British father told Nahpope that if the Sacs never had sold their land, of course they had a right to live upon it. That was all. On the way back, Nahpope stopped to see Wa-bo-kieshiek, or White Cloud, who was half Sac and half Winnebago, and a great medicine-man or prophet. He had a village at his Prophet's Town, thirty-five miles up the Rock River, in Illinois. White Cloud pretended to rival the Open Door of the Shawnees. He fell into a trance, and cut several capers, and spoke a message from the Great Spirit. Let Black Hawk go to war. The Great Spirit would arouse the Winnebagos and the Potawatomis and the British, and the Americans would be driven away! White Cloud said this out of his own heart, which was black toward the Americans. He invited Black Hawk to visit him and the Winnebagos and the Potawatomis, raise a summer crop and talk with the Great Spirit. Much rejoiced, Nahpope hastened to tell the news to his chief. When Keokuk heard it, he advised Black Hawk to stay at home. The prophet White Cloud was a mischief maker and a liar. 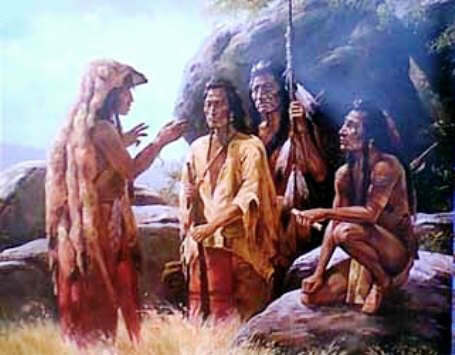 Black Hawk was inclined to listen, and to wait until he was more certain of the other nations who might join with him. But the young men of his band were hot. Unless he did something, Keokuk would appear to be stronger than he. His people looked to him to get back their village and their grave-yard. The black mark on his face had not been wiped off. None of Keokuk's Sacs or the Foxes would help him. So in April of 1832 he took his men and their families and started up the river from Fort Madison, Iowa, for Rock River. The warriors were on horses, the women and children in canoes. By the last treaty that he had signed, Black Hawk had promised not to cross to the east side of the Mississippi without the permission of the United States. Now he said that he was going up the Rock River, to the country of the Winnebagos, his friends, to visit among them and plant corn and beans. On the way up the Rock River he was ordered back, by word from General Henry Atkinson, commander at Fort Armstrong. Black Hawk replied that he had a right to travel peacefully, the same as white persons. He was going to the Winnebago country, for the summer. The general sent another word, that if Black Hawk did not turn arc and, soldiers would make him turn around. Black Hawk replied that he was at peace and would stay at peace unless the soldiers attacked him. He told his men not to fire first. Pretty soon he met some Winnebagos and Potawatomis. They said that their nations never had sent him any message talking war. They wished no trouble with the United States. Wabokieshiek had lied. So Black Hawk decided to give his guests a dog-feast, and then return home. He was an old man of sixty-five, and he was too weak to fight alone. He was getting tired. He had made camp one hundred miles up the Rock River, near Kishwaukee, a few miles below present Rockford, Illinois. By this time, early in May, all Illinois was alarmed; the regulars and militia were on his trail. They gathered at Dixon, about forty miles down the river from his camp. Major Isaac Stillman took two hundred and seventy-five mounted militia, to scout for Black Hawk. They arrived at Sycamore Creek, within eight miles of him, and did not see his camp. But Black Hawk knew that they were there. He sent out three young men with a white flag, to bring the American chiefs to the camp, for a council; then they would all go down-river together. He sent out five young men to follow the three, and see what happened. Only three of the five came back. The three with the white flag had been taken prisoners, and the soldiers had chased the others and shot two. Black Hawk prepared for war. He had but forty men with him; the rest were out hunting. Presently here came all the white soldiers, galloping and yelling, to ride over him. They were foolish—they seemed to think that the Sacs would run. But Black Hawk was old in war. He laid an ambush—his forty warriors waited, and fired a volley, and charged with the tomahawk and knife, and away scurried the soldiers like frightened deer. They fled without stopping forty miles to Dixon's Ferry. They reported that they had been attacked by fifteen hundred savages. They left all their camp stuff. Fourteen soldiers had been killed—but no Indians, except those sent by Black Hawk to treat for peace. "Stillman's Run," the battle was called. Black Hawk sat down to smoke a pipe to the Great Spirit, and give thanks. Two of the flag-of-truce party came in. They had escaped. The third young man had been shot while in the soldiers' camp. The Black Hawk band took the blankets and provisions left in the soldiers' camp, and proceeded to war in earnest. Of what use was a white flag? They sent away their families. Some Winnebagos, hearing of the great victory, enlisted. Now Black Hawk was much feared. General Atkinson fortified his regulars and militia, at Dixon's Ferry. More volunteers were called for, by the governor of Illinois. The Secretary of War at Washington ordered one thousand additional regulars to the scene, and directed General Winfield Scott himself, the commander of the United States army in the East, to lead the campaign. For a little war against a few Indians there were many famous names on the white man's roll. Among the regulars were General Scott, later the commander in the war with Mexico; Colonel Zachary Taylor, who had defended Fort Harrison from Tecumseh—and probably Black Hawk—in the war of 1812, and who was to be President; Lieutenant Jefferson Davis, who became president of the Confederate States; Lieutenant Albert Sydney Johnston, who became a Confederate general; Lieutenant Robert Anderson, who commanded Fort Sumter in 1861; and among the volunteers was Captain Abraham Lincoln. Black Hawk had about five hundred braves, mainly Sacs and Foxes, with a few Winnebagos and Potawatomis; but when twenty-five hundred soldiers were chasing him through the settlements, he stood little show. After several skirmishes, and one or two bad defeats, his people were eating horse-flesh and bark and roots. To save them, he planned to go down the Wisconsin River, in southwestern Wisconsin, and cross the Mississippi. He put his women and children and the old men on rafts and in canoes. They started but soldiers fired into them, from the banks, killed some and drove the rest into the forest. Many died there, from hunger. Black Hawk and his warriors, and other women and children, had cut across by land. When they came to the mouth of the Bad Axe River, at the Mississippi above the Wisconsin, the armed steamboat Warrior met them. Sioux were upon the western bank. Black Hawk decided to surrender. He again raised the white flag, and called out to the captain of the Warrior that he wished a boat sent to him, so that he might go aboard and talk peace. Perhaps the Winnebago interpreter on the Warrior did not translate the words right. At any rate, the captain of the Warrior asserted that Black Hawk was only trying to decoy him into ambush. He waited fifteen minutes, to give the Indian women and children that much time to hide; then he opened on the white flag with canister and musketry. The first cannon shot "laid out three." In all, he killed twenty-three. Black Hawk fought back, but he could not do very much against a steamboat in the river. So he had been unable to surrender, or to cross the Mississippi. His people were frightened, and sick with hunger and wounds. The next morning, August 2, he was working hard to get them ready to cross, when General Atkinson's main army, of four hundred regulars and nine hundred militia, fell upon him at the mouth of the Bad Axe. The Indian women plunged into the Mississippi, with their babes on their backs—some of them caught hold of horses' tails, to be towed faster; but the steam-boat Warrior was waiting, sharp-shooters on shore espied them, and only a few escaped, into the hands of the Sioux. In two hours Black Hawk lost two hundred people, men and women both; the white army lost twenty-seven in killed and wounded. This finished Black Hawk. He got away, but spies were on his trail, and in a few weeks two Winnebago traitors captured him when he gave himself up at Fort Crawford, Prairie du Chien, Wisconsin. He expected to die. He had turned his medicine-bag over to the Winnebago chief at the village of La Crosse, Wisconsin—and he never got it back. You have taken me prisoner with all my warriors. I am much grieved, for I expected to hold out much longer and give you more trouble before I surrendered. I tried hard to bring you into ambush, but your last general understands Indian fighting. I fought hard, but your guns were well aimed. The bullets flew like bees in the air, and whizzed by our ears like wind through the trees in winter. My warriors fell around me; I saw my evil day at hand. The sun rose dim on us in the morning, and at night it sank in a dark cloud, and looked like a ball of fire. That was the last sun that shone on Black Hawk. His heart is dead. He is now a prisoner to the white men; they will do with him as they wish. But he can stand torture and is not afraid of death. He is no coward. Black Hawk is an Indian. He has done nothing for which an Indian ought to be ashamed. He has fought for his people, against the white men, who have come year after year to cheat him and take away his lands. You know the cause of our making war. It is known to all white men. They ought to be ashamed of it. The white men despise the Indians and drive them from their homes. An Indian who is as bad as the white men could not live in our nation; he would be put to death and be eaten up by the wolves. The white men are poor teachers; they shake us by the hand, to make us drunk, and fool us. We told them to let us alone, but they followed us. Things were growing worse. There were no deer in the forests; the springs were drying up and our women and children had no food. The spirits of our fathers arose and spoke to us, to avenge our wrongs, or die. Black Hawk is satisfied. He will go to the land of spirits, content. He has done his duty. His father will meet him there and praise him. He is a true Indian and disdains to cry like a woman. He does not care for himself. He cares for his nation. They will suffer. His countrymen will not be scalped; the white men poison the heart. In a few years the Indians will be like the white men, and nobody can trust them. They will need many officers to keep them in order. Goodby, my nation. Black Hawk tried to save you. He drank the blood of some of the whites. He has been stopped. He can do no more. After this, Black Hawk had little authority among the Sacs and Foxes. They respected him, but they looked only to Keokuk for orders and advice. Keokuk was made rich by the United States, as reward; he gave out the goods and monies; he ruled, for he had followed the peace trail. The Black Hawk prisoners were put in charge of Lieutenant Jefferson Davis, at Fort Crawford. Then they were sent down by steamboat to Jefferson Barracks, at St. Louis. There were Black Hawk, his two sons—Nah-se-us-kuk or Whirling Thunder, and Wa-saw-me-saw or Roaring Thunder; White Cloud, the false prophet; Nahpope, the head brave; Ioway, Pam-a-ho or Swimmer, No-kuk-qua or Bear's-fat, Pa-she-pa-ho or Little Stabber; and others. They were forced to wear ball and chain. "Had I taken the White Beaver [who was General Atkinson] prisoner, I would not have treated a brave war chief in this manner," complained Black Hawk. Keokuk, the successful, was kind and tried to get the prisoners freed. But they were sent on to Washington, to see the President. Resident Andrew Jackson understood Indians, and Black Hawk was pleased with him. "I am a man; you are another," he greeted, as he grasped President Jackson's hand. "We did not expect to conquer the whites," he explained. "They had too many houses, too many men. I took up the hatchet to avenge the injuries to my people. Had I not done so, they would have said, 'Black Hawk is a woman. He is too old to be a chief. He is no Sac.'" From the last of April until June 4 the Black Hawk party was kept in Fortress Monroe, Virginia. Then the Indians were started home. They were given a long tour, to show them the power of the United States. They stopped at Baltimore, Philadelphia, New York, Albany, Buffalo and Detroit. The white people crowded to see the famous Black Hawk and to hear him speak. He received valuable presents. He was treated like a chief indeed, and his heart was touched. When he arrived at Fort Armstrong again, on Rock Island, where he was to be freed, his heart had somewhat failed. The village of Saukenuk had long ago been leveled in ashes; he returned, a chief without a people. Keokuk came, to attend this council, and to receive him back into the nation. Keokuk arrived riding grandly in two canoes lashed side by side; a canopy over him and his wives with him, and medals on his breast. That was rather different from ball and chain, and old Black Hawk's head sank upon his chest. He felt as bitter as Logan the Mingo had felt. Before he finally settled down in a lodge built near Iowaville on the lower Des Moines River, Iowa, he made other trips through the East. Keokuk went, also—but it was "General Black Hawk" for whom the people clamored. He died on October 3, 1838, at his home. His last speech was made at a Fourth of July banquet, at Fort Madison, Iowa, where he was a guest of honor. "Rock River was a beautiful country. I liked my towns, my corn-fields, and the home of my people. I fought for it. It is now yours; keep it as we did. It will bear you good crops. "I once was a great warrior. I am now poor. Keokuk put me down, but do not blame him. I am old. I have looked upon the Mississippi since I was a child. I love the Great River. I look upon it now. I shake hands with you, and hope you are my friends." These were some of his words. He was seventy-one when he died; a spare, wrinkled old man with sharp, fiery face and flashing eye. He picked out his grave—at a place about half a mile from his cabin, where, he said, he had led his Sacs in a great battle with the Iowas. All his people, and the neighboring whites, mourned him. He was buried sitting up, clad in the uniform given him at Washington, by the Secretary of War. We wore three medals, from President Jackson, ex-President John Quincy Adams, and the City of Boston. Between his knees was placed a cane presented to him by Henry Clay, the statesman; at his right side was placed a sword presented to him by President Jackson. All his best things were buried with him. They included tobacco, food and moccasins, to last him on a three day's journey to spirit land. The grave was covered by a board roof. A United States flag, and a post with his name and age and deeds, were erected over him. A picket fence twelve feet high was built around the grave. He left an old wife—the only wife that he had ever taken. He thought a great deal of her. He rarely drank whiskey, he fought it among his people; he was opposed to torture; he had treated prisoners kindly; he had waged war in defense, as he believed, of his own country; and altogether he had been a good man in his Indian way. His bones were dug up by a white doctor, and strung on a wire to decorate an office in Illinois. Black Hawk's sons did not like this, and had the bones brought back. They were stored in the historical collection at Burlington, where in 1855 a fire burned them. Black Hawk probably did not care what became of his old bones. He was done with them. The white race had over-flowed the land that he loved, and the bones of his fathers, and he had ceased fighting. The Native American Indian Story of Black Hawk provides an opportunity to read about the life and times of Native American Indians and many of their great chiefs and famous leaders. A Classic Short story about Black Hawk for kids and children of all ages. This short story of Black Hawk is great to read to kids and children at bedtime. This very short story contains folklore about the famous people of Native Indian tribes. This short Native American story has been selected to keep the attention of kids and children of all ages. Many of the traditional stories featured in this section are true and others are folk stories or myths and legends. Read our free short story online about Black Hawk. Read a free, online short story about the people of famous tribes Native American Indians to increase knowledge and understanding of the indigenous people of North America. The Story of Black Hawk. Discover the vast selection of pictures which relate to the Stories, History and Culture of Native Americans. The pictures show the clothing, War Paint, weapons and decorations of various Native Indian tribes that can be used as a really useful educational history resource for kids and children of all ages. We have included pictures and videos to accompany the main topic of this section - The Native American story of Black Hawk. The videos on this website enable fast access to the images, paintings and pictures together with information and many historical facts. All of the articles and pages can be accessed via the Native Indian Tribes Index - a great educational resource for kids.